If you can judge a man by his enemies, then I'm with Michael Moore. The vitriol heaped on him earlier this year with the release of Fahrenheit 9/11 seemed shockingly disproportionate to his alleged crimes; he is, after all, a filmmaker and a muckraker, not an enemy of the state. (Draw your own conclusions here, about Hillary Clinton's vast right-wing conspiracy, or, if you prefer, about Ari Fleischer and what is and is not helpful.) I'm no Moore apologist, and have some journalistic and aesthetic criticisms of his work—even his most dogged defenders would probably admit that he can be a little sloppy with the facts (he's not a reporter, by training, instinct or inclination), and as passionate as he can be about the causes in which he believes, occasionally it seems that Michael Moore's favorite subject is Michael Moore. (Notice the first-person pronoun in the title of his first film, Roger and Me.) The Big One is a relatively minor effort from Moore, and it's already a little dated, but if you share even part of his political philosophy, you'll get a charge out of at least some of this, for no one is better than Moore in making the right people squirm. The Big One chronicles Moore's 1996 book tour to support Downsize This!, and is more or less a random series of anecdotes from his road trip. The dangers of spilling over into solipsism are evident from the first frame—this is, on some level, a movie all about Moore's self-promotion. (See the movie! Buy the book! Then see the next movie!) And when the focus is on Moore, the filmmaking is at its weakest—you can see that it's a drag, the same questions in carbon-copy interviews all day every day, hopping from airport to airport, looking for luggage and the rental car—but it's also hard to work up sympathy for an author with a book on the New York Times bestseller list bellyaching about the tedium of the junket. Moore at one point crosses paths with Garrison Keillor, a veteran of this sort of venture, and they share stories from the road; they're tired and bored, but I and every other writer I know would swap places with them in a heartbeat. Moore also makes public appearances, at universities and elsewhere, to adoring crowds, and he's got his patter down; he's funny, but it's also a reminder that, as George S. Kaufman said, satire is what closes on Saturday night. (There's not much currency, for instance, for Steve Forbes jokes these days.) The best aspects of the film, though, show Moore doing what he does best: holding the proverbial corporate feet to the fire. He visits with U.S. factory workers whose jobs are being sent overseas, and tries to crash in on the executives who are making those decisions, not to go from loss to profit, but to go from profit to higher profit. One poignant visit is to Centralia, Missouri, where the factory that manufactures Payday candy bars is being shut down; Moore later tries to deliver a check for sixty-five cents to management, payment for the last Payday to roll off the line. Say what you want about Moore, but there aren't a lot of people in the public arena talking about the economic squeeze on the working class, or holding accountable executives who are moving jobs by the thousands from Milwaukee to Mexico. Nobody is telling the corporations not to turn a profit, but, as Moore says, "If it's just about profit, why doesn't General Motors sell crack?" Some of the details of corporate excess are astounding—forget about the tax giveaways, and think about the fact that TWA has contracted with California prisons to get inmates to take the graveyard shift as phone operators on the reservations lines. Be careful before you mouth off to the guy who tells you that there's no aisle seat available for the Thanksgiving flight to see Grandma; he may be doing twenty-five to life. (TWA is not alone; Microsoft and Eddie Bauer also happily contract out some of their labor to inmates.) A Chicago radio interview with Studs Terkel is in many ways the heart of the movie, Moore's articulation of the dignity of work, the need for organization, and the corporate crimes committed in the names of shareholders; a Michael Moore movie needs a villain, and The Big One finds one in Phil Knight, the CEO of Nike, who fills the slot previously occupied by Roger Smith (in Roger and Me) and Charlton Heston (in Bowling for Columbine). Moore gets Knight to discuss the facts about Nike's Asian factories, employing fourteen-year-olds for exploitation wages; the director tries to get Knight to agree to open a factory in Moore's hometown of Flint, Michigan, but Knight isn't biting. The movie ends with a standoff between the two; Knight is pleased with his company's quarterly profits, while Moore continues to insist that profits alone are not what life is about. Even if you're a tireless critic of Moore, you cannot argue with his selflessness in wanting good jobs at good wages for all of our citizens, and you've got to wonder about whether or not the responsibility of American corporations begins and ends with reports of good news at the annual shareholders' meetings. Image Transfer Review: Originally shot in 1.85, the film has inexplicably and inexcusably been hacked to 1.33 for your DVD-viewing pleasure; it's an especially stark contrast in the box set, with the Bowling for Columbine disc preserving that film's original aspect ratio. Miramax must have their reasons for this, but I do not know what they are. Audio Transfer Review: A little uneven, with some buzzing, but that's to be expected. You'll hear Moore and his interview subjects loud and clear. 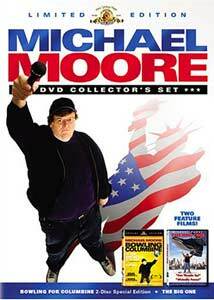 Extras Review: The Big One is bereft of extras, but the box set comes with a bonus third disc: on it, you'll find 39 Cities in 23 Days (13m:13s), a chronicle of Moore's most recent book tour, for Dude, Where's My Country?, in March 2003. Moore is greeted on campuses from coast to coast by rock-star-sized crowds, and the featurette offers highlights from Moore's de facto stump speech—as he delivers it, you can feel him gearing up for Fahrenheit 9/11, as he brims with outrage about George W. Bush and his response to the attacks of September 11th and the war in Iraq, and as he fulminates about the connections between the Bushes and the Bin Ladens, and about our friends at the Carlyle Group. There's not a whole lot here, though; look to Moore's most recent feature for that. In many respects, Michael Moore is America's premier muckraker, and he's up to all of his usual tricks in The Big One, which hits its targets more often than it misses. Some of it is already dated (Ross Perot jokes, anyone? ), and some of it is probably a little bit reckless, and it's full of stunts, but he faces some of the hard truths about who's getting squeezed in the contemporary American economy with more candor, humor and justifiable anger than just about anyone else.